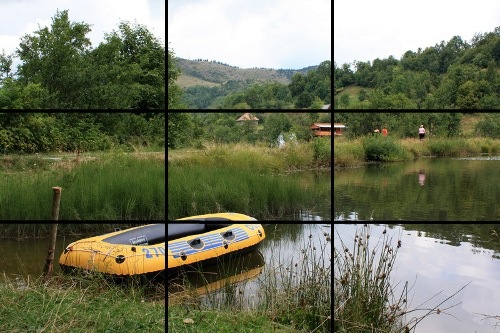 The rule of thirds is one of the most basic composition guidelines in photography. The rule of thirds makes use of a natural tendency of the human eye to be more strongly drawn towards certain parts of an image. The rule states that an image should be imagined as divided into nine equal parts by two equally-spaced horizontal lines and two equally-spaced vertical lines, and that important compositional elements should be placed along these lines or their intersections. The four points where these lines intersect are strongest focal points. The lines themselves are the second strongest focal points. To use the rule of thirds you need to imagine the grid on all of your images as you compose them in the viewfinder. 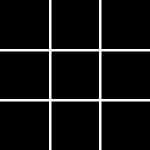 If you have an autofocus camera You can use the autofocus points as references to help you imaging the grid. If you use the LCD screen to compose your images some cameras have an option to draw this grid on the LCD when you compose the picture. Which point or line you place your subject on does matter. While any of the points/lines will add emphasis to your subject, some are stronger than others. When an object is alone in an image, the strongest position is the left hand line. When a subject is not alone there is a hierarchy of image strength. The subject in the foreground will naturally have more strength than the subject in the background. However, the rule of thirds placement can emphasize or reduce this strength. The bottom right point is the strongest for multiple subjects and the upper left point is the weakest. This theory is often used in movies to convey the emotional dominance of one character over another. Placing a background subject on the right and the foreground subject on the left will confuse the eye and lead to confusion in the viewer about which subject is dominant. This technique is very useful for emotionally-charged images. Another general rule (although this rule can be broken in certain circumstances) is that your subject should be placed on the opposite line of the direction your subject is looking towards. For example, a portrait where the subject is looking to the left should place the subject body on the right. While most good portraits appear to be simply a centered torso they are following the rule of thirds. In the case of single portraits, the subject’s eyes are placed along the top rule of thirds line. In multiple subject portraits the subject faces are placed on the rule of thirds lines. This is why a multiple-row posing generally works better than a one-row posing. The rule of thirds technique works well with all subjects but is particularly effective when you are photographing a relatively small subject surrounded by a large expanse of space or against a plain background. The visual weight of your subject balances the vast emptiness. A sailboat on a calm sea centered in the frame appears stagnant and overwhelmed by its surroundings, but if it is placed at a thirds intersection, its position fulfills our need for a dynamic visual tension. You can also use thirds to help organize and support secondary subjects by setting them at diagonally opposite intersections—for example, placing a lone oak tree (the main subject) at the lower left juncture and the rising full moon (a secondary subject) diagonally opposite and above at the upper right intersection. Again, balance and dynamics. Thirds divisions can also help you decide where to place the horizon. If you place it along one of the two frame divisions, you have a quick and effective shortcut for deciding how to arrange the composition. Imagine, for instance, that you’re photographing a Caribbean beach scene that includes sand, sea, and sky. Placing the horizon at the upper line gives the sky one third of the frame and the foreground two thirds, accenting the beach and water. Conversely, placing it along the bottom division line accents the sky by giving it two thirds of the frame. You can use the same principle whether you’re shooting horizontally or vertically. While it’s best to get the image perfect in camera, don’t forget there’s much you can do after the fact to greatly improve many photos. Cropping an image after the capture allows you to apply some of the rules of composition, even if you didn’t get it quite right in the camera. For example, a cluttered scene can be cleaned up by cropping out unnecessary elements. A subject placed in the center of the frame can be moved off center by cropping the image accordingly. Part of the beauty of digital photography is that you can continue to improve your images with tremendous control, even after the picture has been taken. And doing so will help give you a better understanding of what you might want to do differently the next time you’re out taking pictures. Wow very fascinating sharing. Credit on behalf of this….